Box Dimensions (LxWxH) 9.842 x 8.347 x 3.937"
X-Pro W960 Pro Graduated Neutral Density Filter Kit is rated 4.8 out of 5 by 10. Rated 4 out of 5 by C. R. Bieker from Well built, big time size. These filters are some of the largest you will find which is nice if you are shooting very wide. The information on B & H is pretty good given it seems there is a lot of confusion on Cokin grad ND filters. By looking at the cokin website, you might think that you are getting a 4 stop + grad ND filter in this kit, but after shooting through each filter with my light meter I can confirm that you get a 3 stop in the 121S, a 2 stop in the 121M and a 1 stop difference in the 121L. I shot through them several times and this was consistent. If you are looking for X-pro full ND filters of the 8 stop variety, you will have to look in the used department or on *. So even though you see quite a selection on Cokin's website, they can be very hard to find and I don't think they have made many of them for years. On the plus side, they do what they are supposed to do, seem high quality and the case that they come in would make it very hard to scratch the actual filters. but they will take up some space in your bag. Rated 4 out of 5 by ShutterNut from Excellent results for a reasonable price The Cokin system allows you to maneuver the transition zone to the exact point where it is needed most. Its versatile design also enables the photog to rotate the filter to accommodate horizons that are angled due to terrain changes. Provides outstanding results when shooting landscapes where the dynamic range of the scene exceeds the capabilities of the camera's sensor. Care must be taken when shooting into the sunset as lens flair can hamper the image. A hood, hat, or hand can provide a quick solution. Rated 5 out of 5 by Anonymous from Finally no vignetting! Well the product was bigger than I expected but does the job! Allows me to use my 16-35mm to the full at the wide end. These grade fitlers can also serve as a ND filter as the top end will cover the whole lens. An added bonus is that it can be used on a 14mm f2.8 L with Optional adapter or by easily holding the filter in front of the lens. Comes with filter case which will hold additional filters. Great product for the ultra wide shots! Rated 5 out of 5 by Anonymous from Big but Vignette free and great so far. I use this product for Landscape photoghraphy mostly. I have played with it a few times and seen the big difference and asked myself why didn't I buy this long ago? I use D700 with 20-35 for now and am curious how it works with wider or even fish eye photography. Note it is bulky so you can cutout a cardboard to size and see how you can handle it. Be nice to have a reverse filter in the pack too. Rated 5 out of 5 by Anonymous from Unexpected content I was surprised, that the included box is the original cokin filter box. Well made and a good storage. The filters work great for me on a 16-35 wide angle. Rated 5 out of 5 by Anonymous from X-Pro the way to go!! I have used the X-pro on sunrise sunset and the rising tide and it gives great contrast reduction. Rated 5 out of 5 by Don from Glad I have it I use this system on a Mamiya AFD II & P30+ with great results. Looking forward to using it in an upcoming Alaska trip. Rated 5 out of 5 by YK from Always keep its quality standard It's a pro product for pro. Great for landscape and seascape photography. Can Cokin Z filters be used with an X holder? 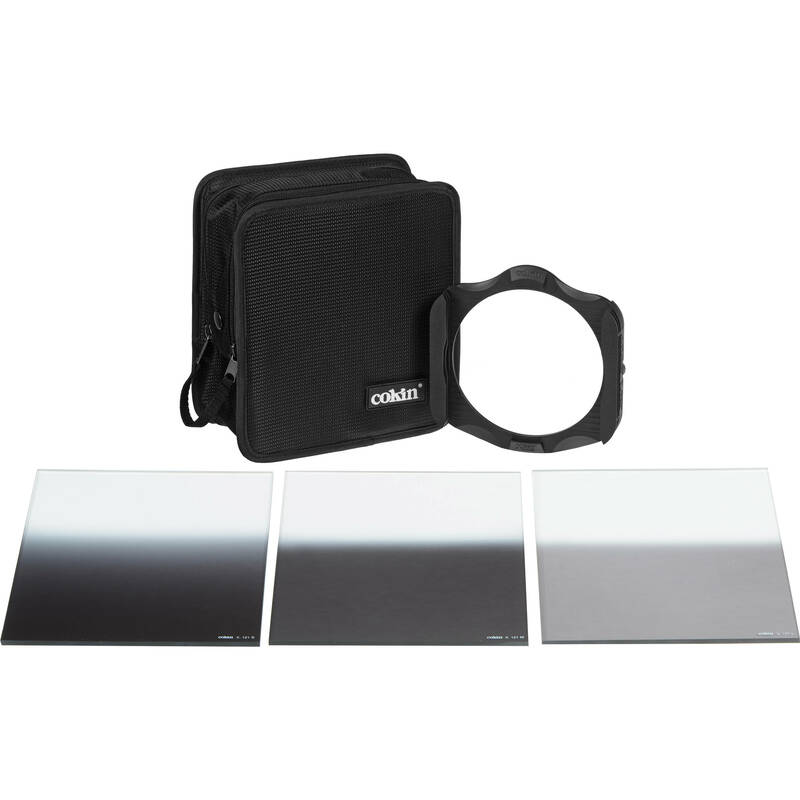 Cokin Z filters need to be used with Cokin Z holders, and the same applies for the Cokin X system. I have a Canon 70d along with a tamron 11-16mm. Should i go for Xpro or Zpro will serve the purpose considering the wide angle? Just to let you know that the Xpro which i purchased are extremely large and the Zpro may be somewhat more comfortable for carrying out and about, but in saying that I have no issue with the Xpro they do exactly what I need them for. Can anyone give feedback on the use of these filters with 95mm lense for video? Any adverse effects on auto focus? resolution? vignetting? Any suggestions for better filters for that application? The Cokin X-Pro holder works with lenses that have a filter thread 62-112mm. It will fit on lenses that are 95mm filter thread. The correct adapter needs to be purchased separately.Vignette is an issue but it depends on the specific lens and how wide the lens is and what size the sensor the camera has. An APS-C camera can work with wider lenses before it will vignette compared to full frame cameras. Use this with 35mm lenses? Yes, I have used it at 24mm without any vignetting at all. I've heard you can even go wider to 16mm but I don't have super-wide angle lens like that to try it. The only problem I have with the XPro series is that there is very a few filters available and those are very expensive. can you buy other types of filters, polarizer act. Does this product require an adaptor ring in addition to what is in this package? Yes it does. You need adapters for your lense front filter diameter.